The CSU College of Business Executive MBA utilizes a unique learning structure by blending online courses with in-person learning. With about 60 percent of classes held at the downtown Denver every other Saturday, EMBA students can still enjoy a flexible schedule while continuing to work full-time. The 21-month program takes place over five consecutive semesters and includes a 10-day international residency. The 42-credit program consists of 36 core credits and six elective credits. The four-month semesters are broken into two parts, so students take different eight-week classes during each half-semester. While the core courses enlist a blend of traditional MBA learning with executive-focused courses, the electives allow the working professionals to tailor their curriculum based on what is most relevant to their career path. The online component of the program is designed for students to virtually collaborate with classmates by working on real-world business challenges and simulations. An average cohort size in the CSU College of Business Executive MBA program is 25. 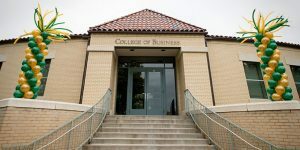 The estimated tuition for the CSU College of Business Executive MBA, both in and out-of-state, is $76,902, and includes fees, books and materials, meals on on-campus days, and international trip expenses. The school offers partner program benefits to reduce tuition by 10 percent: in order to qualify, applicants must be employed by one of the approximately 30 corporate partners. Unlike many other MBA programs, applicants to the Executive MBA do not need to submit a GMAT score, as the school believes that evaluating old test scores after several years of work experience is an antiquated requirement. A completed application consists of a data form, transcripts from all institutions attended with a minimum GPA of a 3.0, proof of at least eight years of work experience, a résumé and a statement of purpose, and three professional recommendations.